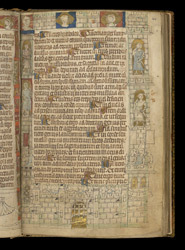 Its border designed to depict a castle under seige, this page comes from the section of instruction on war. The castle bristles with armed soldiers and arrows flying from its walls. They are fending off the attack of the army on the facing page, who have wheeled out their seige machine. On both pages, the decoration remains unfinished, raising doubt that Milemete ever presented the book to the king.